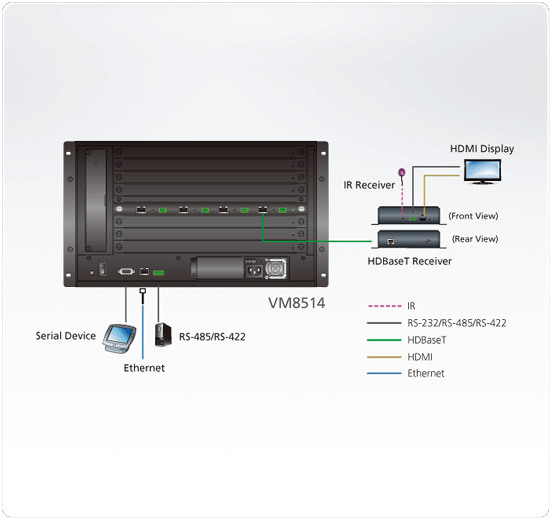 The VM8514 4-Port HDBaseT Output Board offers an easy way route 4 HDBaseT transmitters connected to HDMI sources to 4 HDBaseT receivers connected to HDMI displays, and in combination with the ATEN Modular Matrix Switch provides the ability route up to 16 input and 16 output HDBaseT connections. When the VM8514 HDBaseT Output Board is used in conjunction with the VE805R HDBaseT receiver it features Seamless Switch� technology and video wall functionality. ATEN's Seamless Switch� technology provides video switching in real-time with a built in scaler that handles different video resolutions across different displays and video wall features that allow you to configure up 32 profiles for custom layouts via the point-n-click web GUI.